What Is the Difference Between a Frappe and a Milkshake? 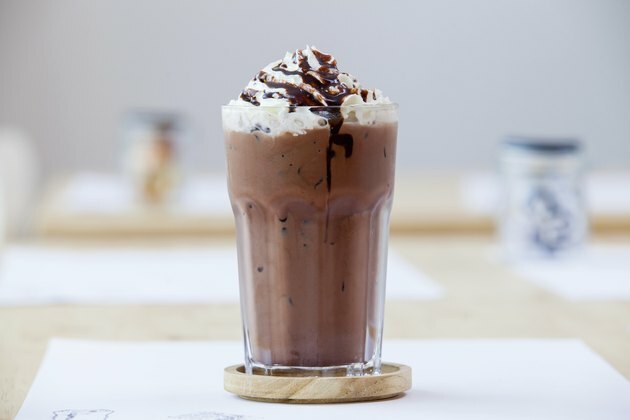 Coffee shops across the country offer cold, creamy frappes, while the local ice cream parlor serves up old-fashioned milkshakes. Both treats are milk based and served with a straw. Milkshakes typically come in classic flavors like vanilla, chocolate and strawberry. Frappes are typically coffee or tea flavored. Like many foods, regional differences may affect the definition of a shake or a frappe. A thick, rich shake requires ice cream, milk and flavorings. You can add a bit of sugar for additional sweetness. Achieve the right texture by using twice as much ice cream as you do milk, allowing at least 1/2 cup milk and 1 cup of ice cream per shake. Add 1/2 tsp. of vanilla per cup of ice cream, or 1 tbsp. of strawberry or chocolate syrup. Intensify the flavor of a chocolate or strawberry shake by using chocolate or strawberry ice cream in place of vanilla. You won't add any other liquids or ice to a shake. The simplest frappe contains coffee, milk, sugar and ice. These ingredients are blended together to form a frothy, light drink. Commercial frappes may include thickeners to help bind together the ice chips and liquid ingredients. Most frappes do not contain ice cream, and many rely upon coffee shop-style flavoring syrups in place of ice cream toppings. While the difference between a coffee or tea based frappe and an ice cream-based milkshake holds true in most of the country, it's not true everywhere. In and around Boston, a frappe is a milkshake, rather than a coffee drink. In Greece, a cafe frappe doesn't involve ice or fancy flavorings, and may not even include milk. The Greek frappe is a mixture of instant coffee and sugar, shaken to form a froth and served over ice. While either a shake or a frappe can refresh you on a hot day, you may want to remember the difference. You can cut the fat in calories in a frappe, but it's not so easy with a shake. Order your frappe sugar-free and nonfat for a diet-friendly treat. Most frappes do contain caffeine, so keep this in mind if you're looking for a late-night sweet. Shakes can be lightened up at home with light ice cream and skim milk, but if you're out, expect them to come with a high calorie count. How Many Calories Does a Frappuccino Have?